The recently opened Yayoi Teishoku in The Galleries has seen an influx in diners since it opened its doors in August. The new concept store promised individual ipads to order, a seasonal a la carte menu which also included a teishoku menu, which is your meal as a set menu which includes miso and rice and vegetables or Japanese pickles called “tsukemono”. We arrived early to beat the crowd (and lucky we did, because within 10 minutes it was getting busy). There are many dishes and combinations to be had and I have a difficult time choosing but we narrow it down. I decide on the Nasu Miso & Saba Shio-Yaki teishoku. This comes with two dishes in a set meal, offering more to taste! 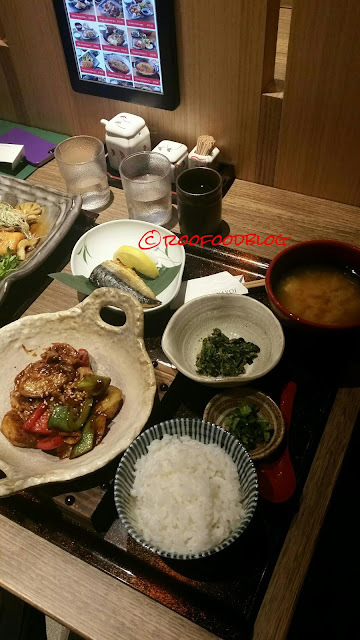 Eggplant with slithers of pork in a miso sauce and a a fillet of the salt-grilled mackerel. My eyes may have bulged a little when the large tray arrived laden with lots of little dishes offering something delicious. From mid left (clockwise) we have the eggplant with pork in miso. Chunks of tender eggplant are coated in a sweet miso with tender slithers of pork. The salt-grill mackerel is lovely. the fillet is overcooked slightly but that does not deter us from the flavour of the salt that sets off the natural oiliness of the fish. It's delicious. There is also a spinach salad with sesame dressing, a bowl of miso soup, a small dish of marinated shallots and a bowl of Kinme rice. 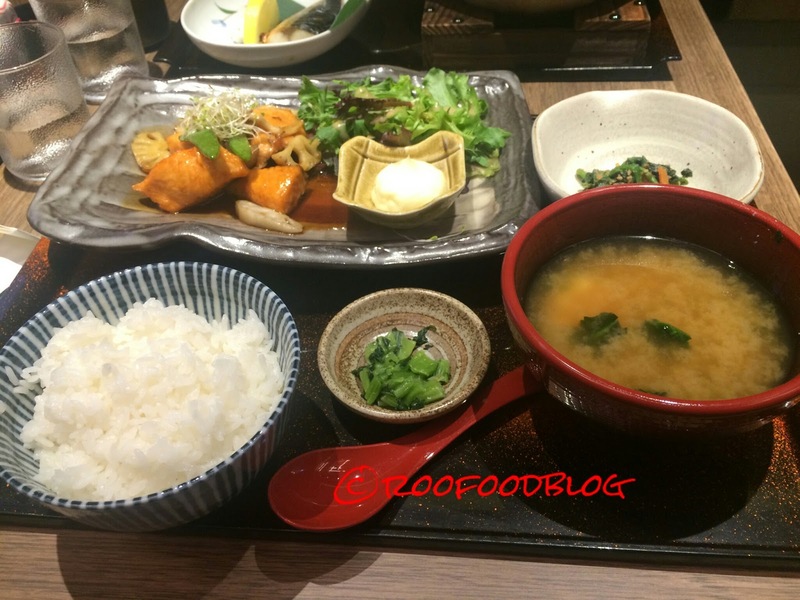 Kinme is a type of rice used by Yayoi that has more health benefits than normal white rice. I really enjoy my Teishoku. My lovely friend Mr G, is dining with me this evening and goes with his stock standard Salmon Teriyaki Teishoku. Large, meaty chunks of tender salmon with a sweet teriyaki glaze. Unfortunately I am too full to event attempt dessert, but make a note that on next visit I am going to do double dessert with the Matcha ice cream and the Matcha Warabi Mochi that looks divine! Definitely a stop to make for a meal, just remember to go early to beat the queue. I love the multi-course set-ups of teishoku. Definitely makes your meal feel like a grand occasion! Didn't realise they'd opened at the Galeries - will have to check it out!